In the past few years, we have really fallen in love with lighthouses <that’s when you know you’re growing up, lol>. Our parents took us to see one in Maine back when we were teenagers, and we have a beautiful one right here in Jupiter, FL that is our favorite <the best place to view it is from one of our favorite waterfront restaurants, Utiki>. 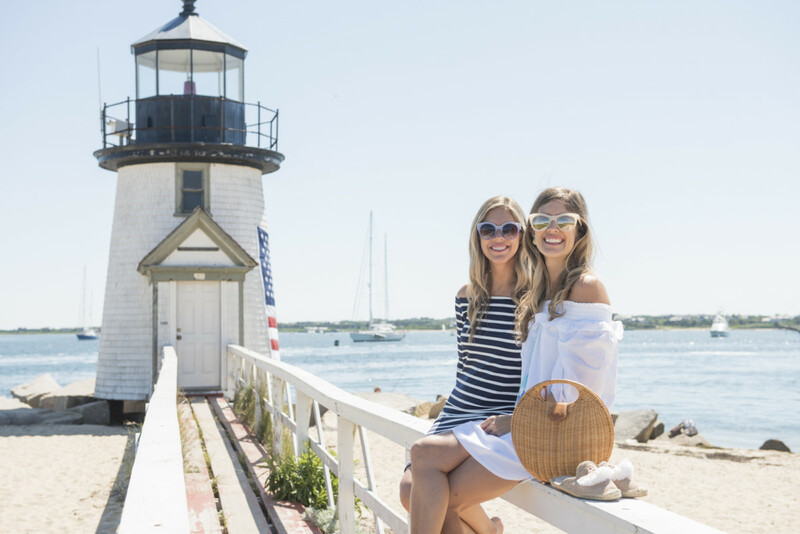 When we were planning our trip to Nantucket, we researched and found out they have three working lighthouses on the island, so we knew we had to visit at least one while we were there! 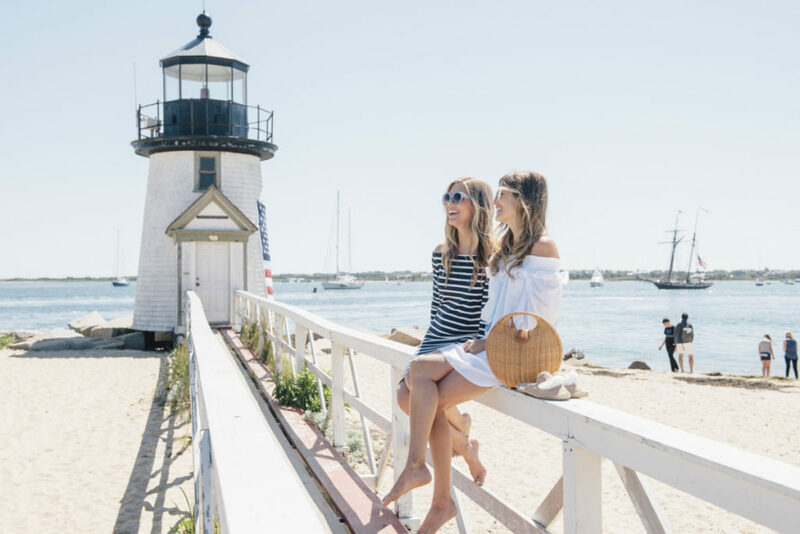 If you have been following along with our Nantucket adventures on the blog, you know we first enjoyed exploring the gorgeous property we stayed at called Harborview Nantucket and walking around Main Street and Straight Wharf <you can read more about that here and here>. We didn’t rent a car for this trip, but that didn’t stop us from wanting to and easily being able to explore more of the island <like this gorgeous lighthouse>! 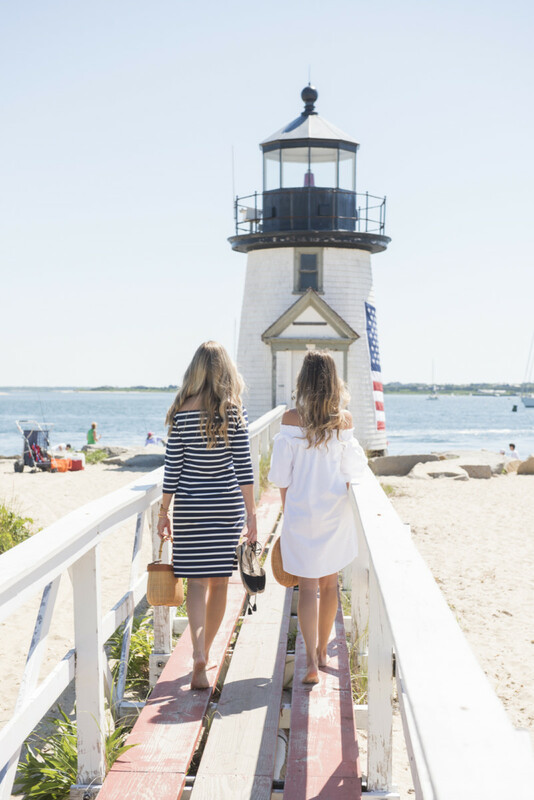 While many people rent bikes to get around Nantucket, we decided to use the bus stop near Harborview at the Whaling Museum one day to take our crew to Millie’s in Madaket for lunch <get the “Smith Point” shrimp tacos, YUM!> and then Uber to Cisco Brewers – such a fun combo! 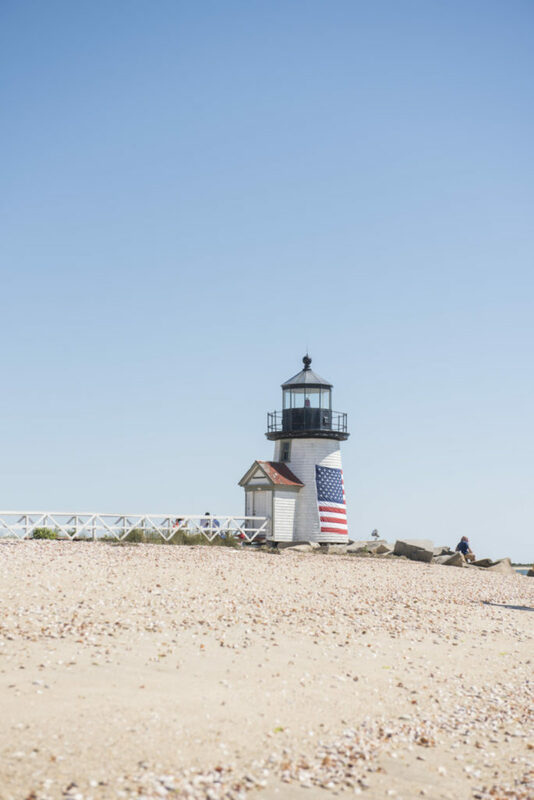 We also took a taxi to Galley Beach one afternoon for drinks on the beach <a must do!>, and local photographer Brian Sager was so sweet to take us to the Brant Point lighthouse <he’s part photographer, part tour guide, lol!>. On this day, the sky was so blue and the weather was so beautiful. 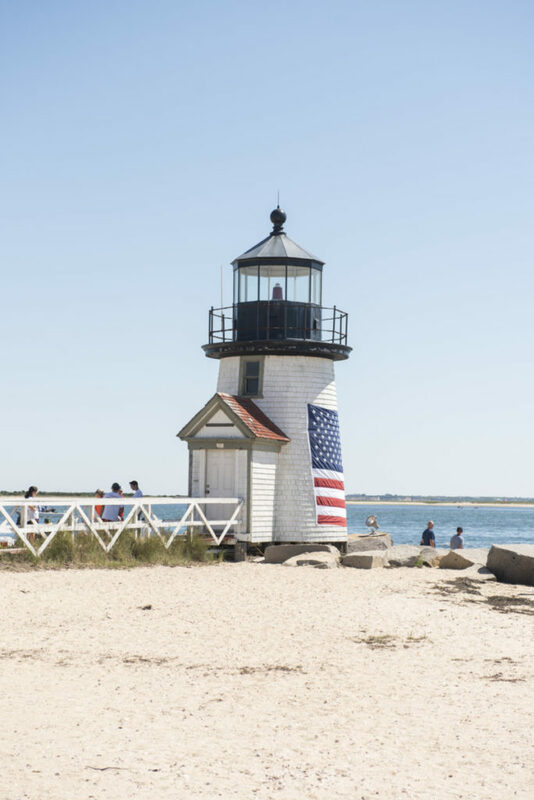 We had fun walking in the sand to see the lighthouse up close <love the American flag on it!> and watching all the boats go by in the harbor. 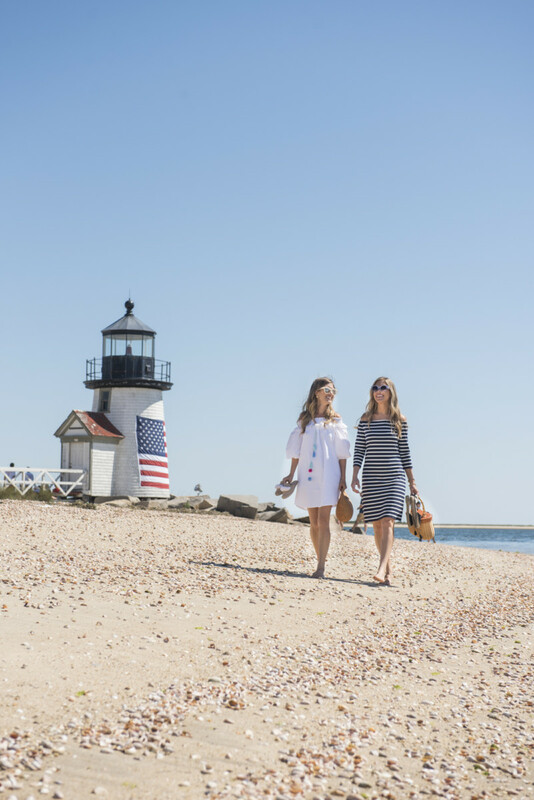 Our new J.McLaughlin dresses are two of our favorite comfy-chic outfits for exploring. 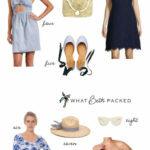 Beth’s white dress has the cutest pom pom details and my striped dress is classic Nantucket style. 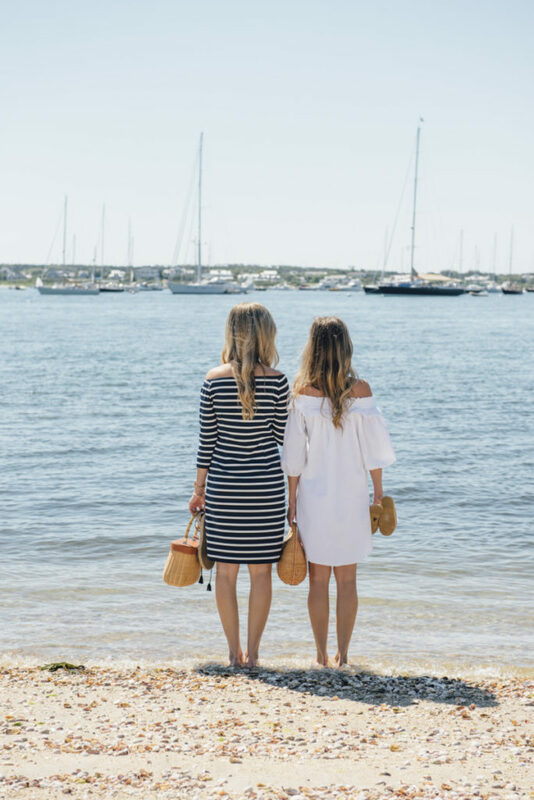 You will often see us wearing their wicker bags <here and here> this summer, too, because they go with anything and everything!